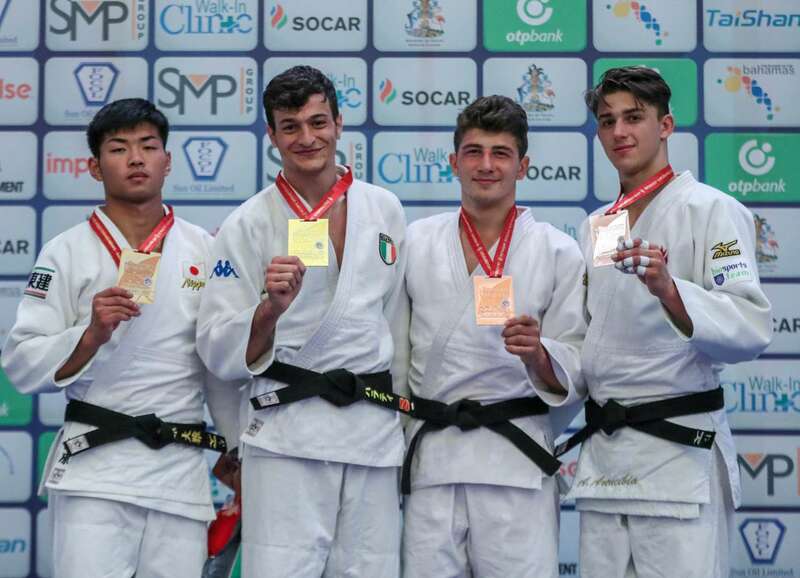 Italy, Georgia and the Netherlands struck gold on day three of the Junior World Championships in Nassau, Bahamas as Italy won two of the four gold medals available to move second in the medal table behind Japan. The Hague Grand Prix bronze medallist Sanne VERMEER (NED) won the Junior World Championships with a comprehensive victory over Minsk European Open silver medallist Laerke OLSEN (DEN) in the -63kg final. VERMEER had a razor sharp focus all day long and immediately breached the scoreboard with a waza-ari from a ko-soto-gari. 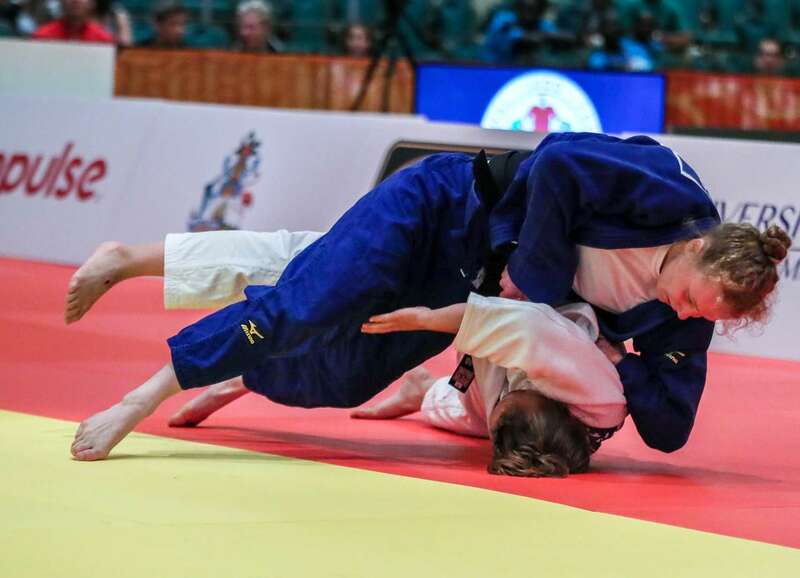 The Dutch starlet won the final moments later with a deep seoi-nage as the former Cadet World Championships winner made sure that her country’s first medal in the Bahamas was gold. 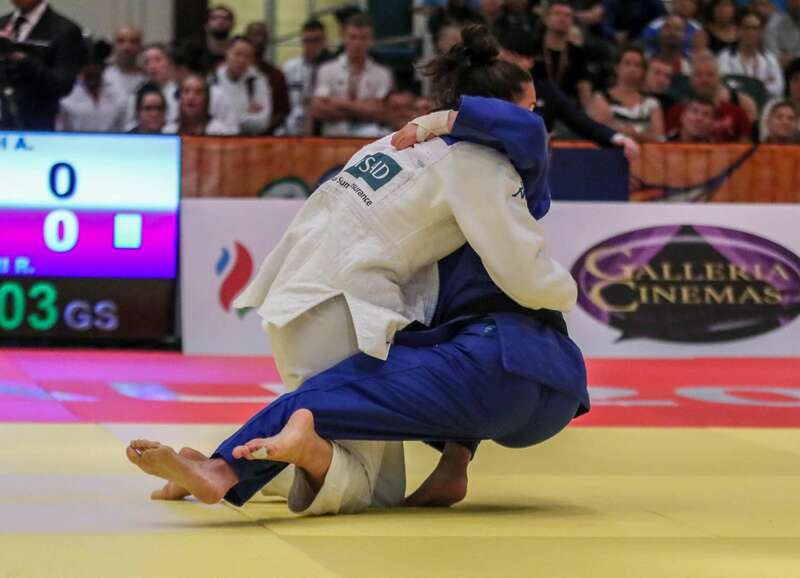 In the first semi-final Junior Pan American Championships gold medallist Celinda COROZO (ECU) was penalised for a third time in golden score against OLSEN and was disqualified with the score tied at a waza-ari apiece. In the second semi-final VERMEER submitted Cadet World Championships silver medallist Natalia KROPSKA (POL) to guarantee at least a silver medal for the Dutch delegation on day three. The first bronze medal was won by St. Petersburg Junior European Cup bronze medallist URA Asumi (JPN) who defeated KROPSKA. Japan started the final block with bronze after URA scored a waza-ari from a harai-goshi after 90 seconds and held on without being threatened. KROPSKA, who was on the mat for 27 minutes in a legendary golden score semi-final contest at the Cadet Worlds last year, can be content with a respectable fifth-place having moved up an age group and a weight category this year. The second bronze medal was claimed by Junior European Championships bronze medallist Anja OBRADOVIC (SRB) who conquered number one seed COROZO in a thriller. COROZO missed with an uchi-mata and ended up on her back for a waza-ari score for OBRADOVIC. The Ecuador judoka restored parity with a waza-ari from a ura-nage but was caught in the closing seconds by the Serbian athlete who doubled her country’s medal tally in the Bahamas. 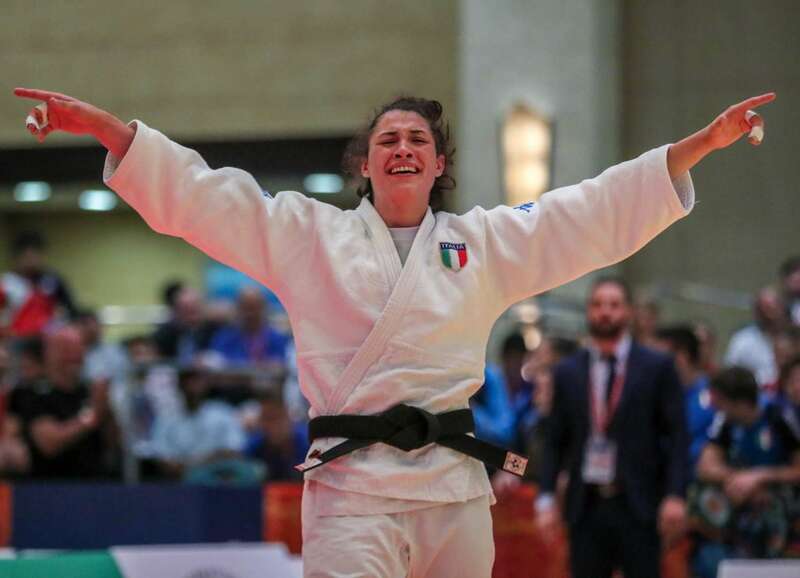 Junior European Championships winner Alice BELLANDI (ITA) won her country’s second gold medal of the day and third overall as she beat uchi-mata specialist SHIMMORI Ryo (JPN) in the -70kg final. BELLANDI took over the contest in golden score with a o-uchi-gari after 66 seconds of added time to send the Italian delegation wild in the stands. BELLANDI cried with tears of joy and held her head in her hands as she could barely believe the scale of her accomplishment. 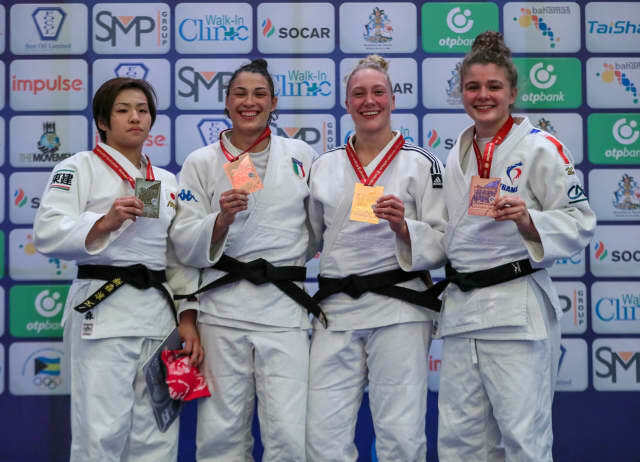 In the first semi-final Junior Pan American Championships gold medallist Ellen SANTANA (BRA) was second best against BELLANDI who won the battle of the continental champions by a waza-ari score. 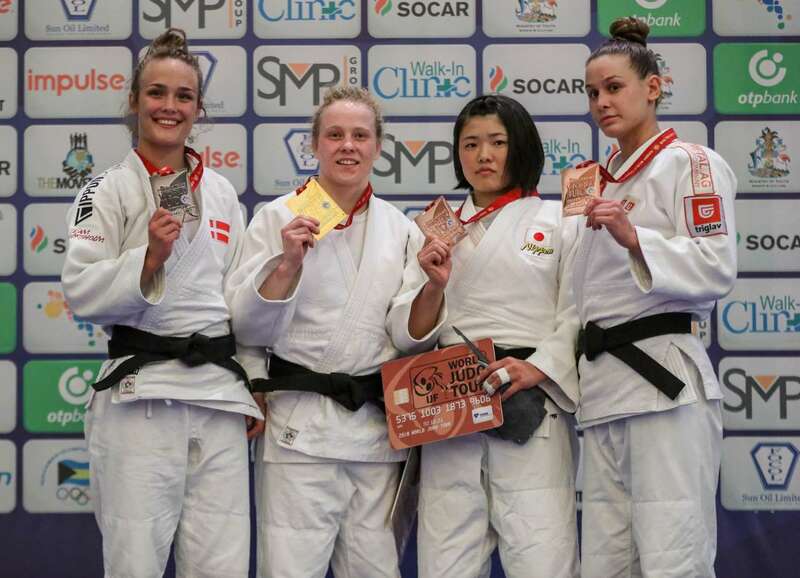 In the second semi-final SHIMMORI defeated Junior European Championships silver medallist Margit DE VOOGD (NED). The Japanese youngster threw with a spinning uchi-mata for a waza-ari score and employed the same technique moments later for her second and match-winning waza-ari. The first bronze medal was claimed by DE VOOGD who bested teammate and two-time Junior European Cup winner Donja VOS (NED) by a waza-ari score with 10 seconds left on the clock. The second bronze medal was won by Junior European Cup bronze medallist Candice LEBRETON (FRA) over SANTANA. France boosted their medal column after LEBRETON threw with a de-ashi-barai and followed up with osaekomi for 10 seconds for the final place on the podium. Number one seed SANTANA left with a fifth-place finish. 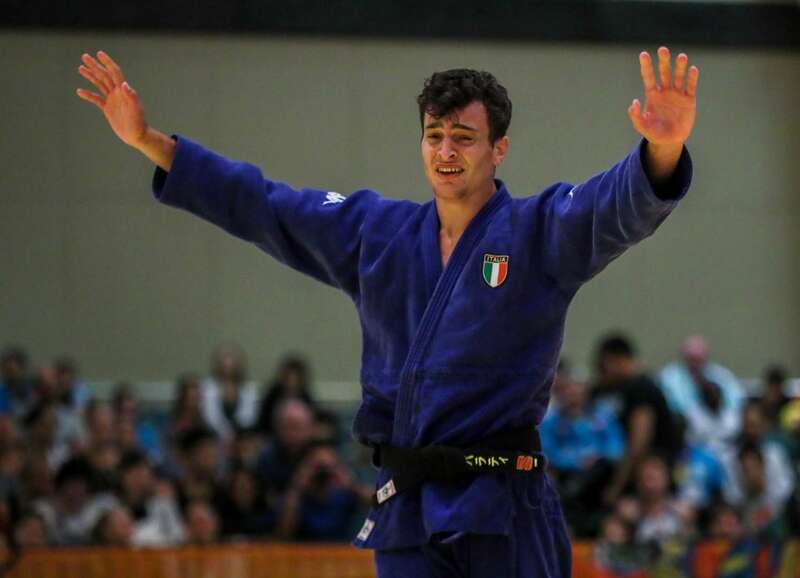 Junior European Championships bronze medallist Christian PARLATI (ITA) was the leading man in the -81kg category as he found a way past KASAHARA Hiromasa (JPN) to spark the now familiar celebrations from the wonderful Italian team. 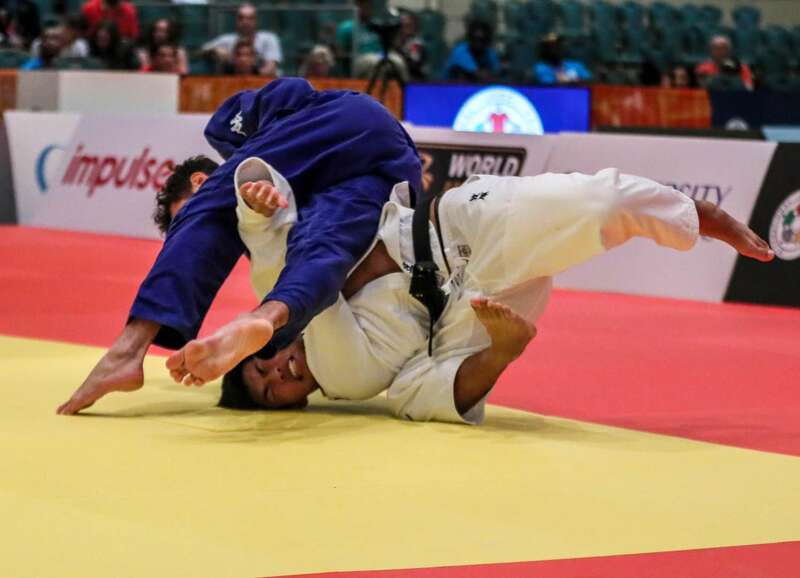 KASAHARA, who was fighting at his first and last Junior World Championships as he will be too old to compete next year, was launched with a ashi-guruma for ippon with 59 seconds left on the clock. PARLATI was lifted up by his coach as the Italian team rushed to the barricades to congratulate their latest champion. The Nippon Club Napoli judoka, who took bronze a year ago, was pounced on by his teammates as the Italian’s showed their incredible team spirit and peerless passion as they prepared to belt out the Italian anthem once again. In the first semi-final KASAHARA downed two-time Junior European Cup gold medallist RAJKAI Robert (HUN) in just 51 seconds as he pinned down his Hungarian opponent with a yoko-shiho-gatame for his second waza-ari score. In the second semi-final PARLATI beat former Cadet Asian Championships winner Dzhakhongir MADZHIDOV (TJK) by a waza-ari score as he rolled over his opponent for the only score in their highly-competitive contest. The first bronze medal was won by Junior European Championships winner Luka MAISURADZE (GEO) who simply overpowered MADZHIDOV. 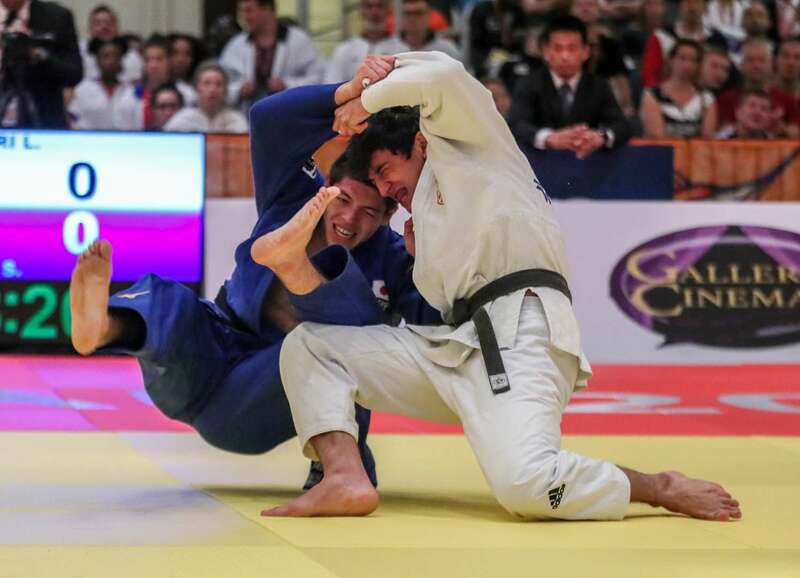 MAISURADZE threw with a harai-makikomi to open the scoring and sealed his win with a uchi-mata-sukashi for Georgia’s second medal in Nassau. The second bronze medal was won by Junior Pan American Championships bronze medallist Alexandre ARENCIBIA (CAN) who defeated RAJKAI in golden score. The Hungarian made the better start as he earned a waza-ari score from a thunderous ippon-seoi-nage before his Canadian rival fought back and scored a waza-ari of his own. Three minutes of golden score was required two separate the two throwers as ARENCIBIA conjured up the definitive moment of a pulsating contest with a modified kata-guruma for a waza-ari score. Cadet World Championships gold medallist Lasha BEKAURI (GEO) was crowned Junior world champion on Friday with a scintillating display in the -90kg category. Georgia’s latest -90kg hope upset highly-touted St. Petersburg Junior European Cup bronze medallist MURAO Sanshiro (JPN) in the final. 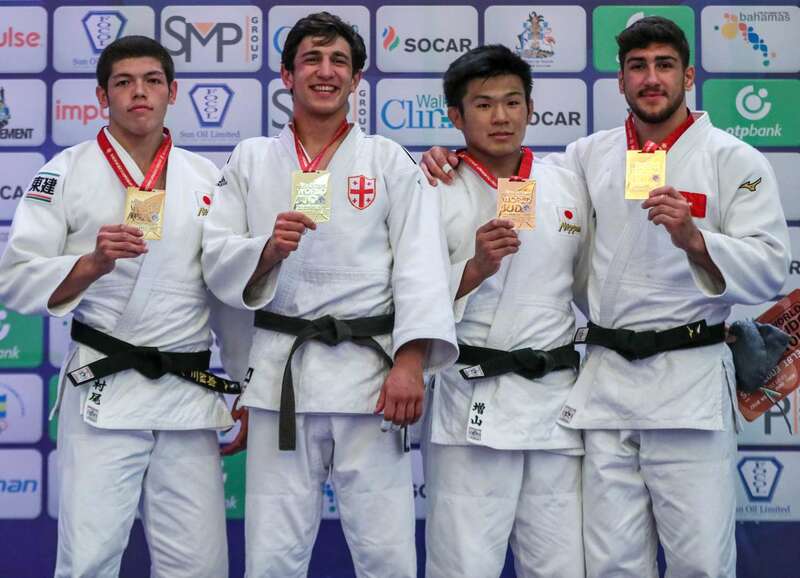 Japan’s 18-year-old national cadet champion, who is coached by Olympian and 2010 world bronze medallist TAKAMATSU Masahiro at Toin High School, was thrown for ippon after just 39 seconds to provide Georgia with their first gold medal of the competition and it was no surprise that it came in their favourite weight category. BEKAURI danced to the Georgian music after leaving the mat being before swarmed on by his teammates. 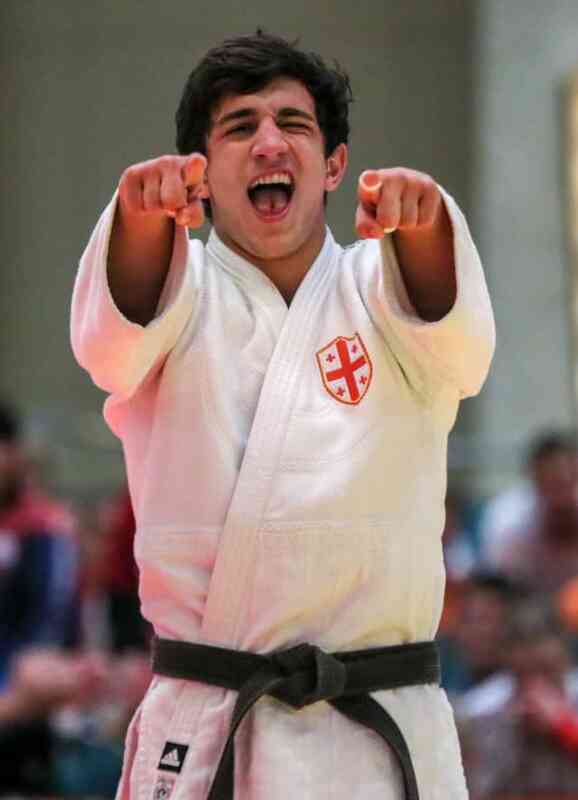 In the first semi-final BEKAURI bombarded one-time Cadet European Cup winner Darko BRASNJOVIC (SRB) with attacks and wrapped up a one-sided win in 80 seconds. The Georgian scored a waza-ari with an o-soto-gari and added a second waza-ari from a kuzure-kesa-gatame hold. In the second semi-final favourite MURAO defeated Junior European Championships winner Falk PETERSILKA (GER) with a o-soto-gari and a ko-uchi-gake at the halfway point with two waza-ari scores on the scoreboard. The first bronze medal was claimed by Oberwart European Open gold medallist MASHIYAMA Kosuke (JPN) who took PETERSILKA over after 11 seconds of added time for a match-winning waza-ari score. The second bronze medal was captured by Junior European Championships silver medallist Mert SISMANLAR (TUR) who stormed past BRASNJOVIC after 38 seconds by ippon. SISMANLAR scored with a o-uchi-gari to claim the final spot on the -90kg podium in the penultimate contest on day three. 12. Apr. 2019 / Chad is not like any other place.